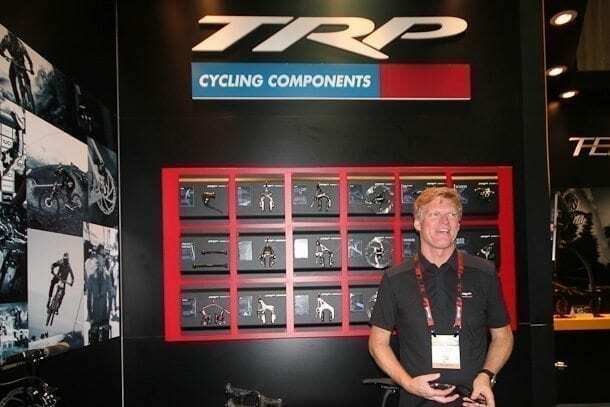 SoCalCycling.com caught up with TRP Brakes Managing Director Lance Larrabee. TRP designs and manufactures some of the highest quality braking systems for road, mountain and cyclocross bikes. With disc brakes becoming more popular on road bikes, we get Lance’s thoughts on their inclusion in the sport. SoCalCycling.com: How long has TRP been making brakes? SoCalCycling.com: TRP makes a vast array of brakes for BMX, MTB, Road, Cross and Time Trial / Triathlon brakes. Which of these areas is the most active market for TRP currently? Lance Larrabee: Currently we are seeing a big growth in the mountain bike market. SoCalCycling.com: What are some of the trends you see for TRP in the marketplace? Lance Larrabee: We are starting to see growth in the mountain bike market. This is a trend the entire industry is experiencing as mountain bike sales are strong. SoCalCycling.com: Now that the UCI has approved disc brake use among the Pro Tour Teams, can you see more teams switching over from rim brakes? SoCalCycling.com: What are the benefits and advantages of using disc brakes on a road bike over standard dual pivot brakes? Lance Larrabee: The immediate advantages are in breaking power and consistency across weather conditions. Long term advantages will be realized as wheels get lighter, stiffer, and better aero dynamics due to the elimination of rim brake tracks. Carbon clinchers also become a more reasonable option as the danger of the rim heating up and popping the tube in eliminated. SoCalCycling.com: TRP has worked with some of the top pro teams in the world including Team Geox who won a Grand Tour on the road, as well as working with some of the Cross and Mountain Bike teams. How does this help TRP in the development of your products for the marketplace? Lance Larrabee: Nobody can push our products to the limit more than the pro’s can. We always encourage our riders to offer as much feedback as possible. We take all of this feedback and give it to our engineers to sift through and improve our products. SoCalCycling.com: Who are some of the top pro teams and riders you’ll be working with for in the 2017 season? Lance Larrabee: Most are on the mountain bike side as we are growing that segment of the business. The 4 time DH World Cup champion and SoCal local Aaron Gwin is probably our most notable rider. On the cyclocross side we have Jamey Driscoll and Caroline Mani who have both been racking up the UCI podiums this season. SoCalCycling.com: In 2012, we saw a pretty cool prototype TRP brake lever / shifters levers called the Hywire that looked like it was almost ready for production. Will we be seeing the Hywire on the market in the near future or similar version? Lance Larrabee: We currently have an updated version of that with our Hylex Di2 conversion kit. This takes your full hydro Hylex system and places Di2 climbing buttons in the inner side of the hoods. SoCalCycling.com: It looks like their have been some recent spy shots of the TRP brakes with some integrated shifting on some Cross bikes on the circuit. Can we expect to see these on the market in the near future and will they be disc only? Lance Larrabee: This is actually a released product and is not available through our distributers or directly through our website. SoCalCycling.com: TRP is making a carbon CX fork, how did TRP decide to make their own fork? Lance Larrabee: We saw an opportunity in the marketplace. The high end fork market had few options and we felt we could make a better product than what was on the market. In the ended we made a light weight fork, with internal cable routing, all in an elegant package. SoCalCycling.com: Can you see TRP venturing off to make other components in the near future?